IT’S FLASH GORDON MEETS FACEBOOK, ASTEROIDS MEETS ACE ATTORNEY! LASER BEAMS, EXPLOSIONS, AND ALL KINDS OF AWESOME! Dive into fast and furious space combat as you zip around far-flung solar systems while blasting nefarious lawbreakers like the Yolo Squad and the Series 4 Protect-o-Trons. And in between space battles, Kamala strives to keep the peace in a Flash-Gordon-meets-Facebook future, where the style and glamour of 1930's retro sci-fi meets #firstworldproblems in a hilarious send-up of pop culture and modern society. Touch down on a wide assortment of planets and see how humanity has kept up with (or fallen prey to) the crazy direction the future has taken us. It's not all just laser beams and energy blasters, either. Kamala reaches out to the citizens of the 912th, encountering an assortment of crazy characters and making the tough calls about justice, mercy and the letter of law. Not to mention that Kamala's crew has problems of their own, from a kid sister running with bad dudes for good health insurance, to a robot cop dog chasing down a feline criminal mastermind. Kamala's got her work cut out for her, but with your help, she can carry the day! Whether searching for the last non-GMO coffee bean to make the perfect latte, restabilizing wormholes to thwart galactic pranksters, or fighting space food trucks with weaponized kale salads, Kamala is there to save the day and Lay Down The Law! Escape Fuel Studios is a tiny dedicated band of developers and artists (based in Seattle, but working all across the US). We want to make bright, exciting, funny games that take you on wild-eyed adventures across space and time. 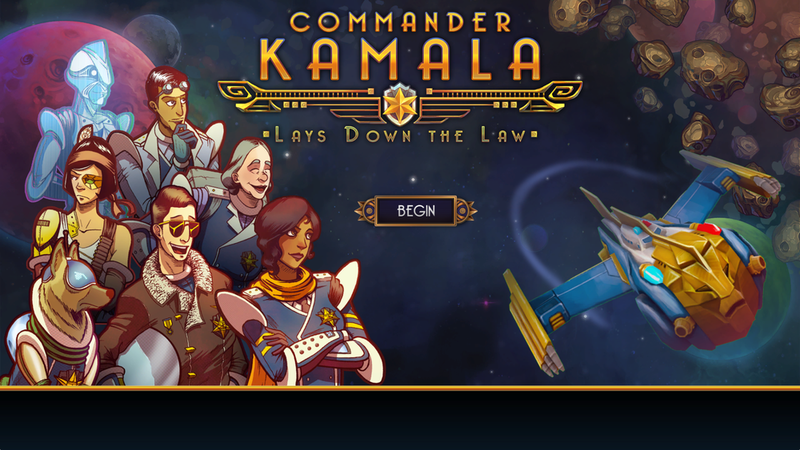 Commander Kamala is our first game, and we're making it JUST FOR YOU. We really hope you dig it.